The second stage of the Local Plan public hearing is set to resume – but the government inspector said this is not an indication that the plan is ‘sound’. The second phase of the hearing will begin on April 17 and last for 10 days. It will focus on housing allocations at villages in the borough together with gypsy and traveller allocations, economic development policies and sustainable design, among other matters. It comes after the first stage ended on February 1. The process of examination is intended to establish the ‘soundness’ and legality of Rugby’s Local Plan. But some residents felt differently. Mike Judge, of Save Dunchurch, said residents were facing a David and Goliath struggle against the plan. Members of local campaign groups including Save Dunchurch, Rugby About Turn, SALFV (Stand Against Lodge Farm Village), Friends of Lime Tree Avenue, Woodlands Residents’ Association and CPRE (Campaign to Protect Rural England) were in attendance. Some campaigners criticised Rugby Council’s hiring of barrister Jack Smyth QC to defend the plan. His online biography states: “Jack is experienced with dealing with residential development appeals. Housing developer St Mowden hired Martin Kingston QC to speak against local campaigners on its behalf. allocations, economic development policies and sustainable design, among other matters. Visit www.rugby.gov.uk/localplan to see copies of the inspector’s correspondence, including guidance notes and a full timetable. On June 21, 2017, The Benn Hall was filled with many angry residents hoping the Local Plan would be amended or even better scrapped, but they left disappointed as councillors voted in favour of the draft plan after a lively debate. The plan a sets out where in the Rugby Borough housing and employment land should be allocated and identifies the supporting infrastructure that will be needed. The plan allocates sites throughout the borough to deliver 12,400 homes by 2031, with space for up to 15,000 homes. The draft Local Plan allocates 110 hectares of employment land and more than 8,000 square metres of retail space. 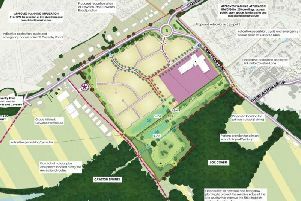 It also includes the controversial 1,500-home Lodge Farm proposal and the 5,000- home South West Rugby plan. Portfolio holder for growth and investment, Cllr Heather Timms, said the plan delivers sustainable growth for the town, along with supporting infrastructure. In addition, Cllr Timms argues the plan will put the town in a stronger position to resist unplanned, speculative development.